What can these symbols do for you? Alchemy symbols can deepen your awareness of the unmanifested, the spirit and the soul. Alchemy and its symbols can boost your focusing ability, taking advantage of the mind's desire to absorb and study new ideas and images. They are great instruments to use for meditation. They can stimulate or relax the mind with their unique, fantastical depictions. Alchemy is rife with intriguing, powerful symbolisms. You may have already heard of the well-known depiction of Alchemy, which is the quest to create the Philosopher's stone. According to legend, this stone enables one to convert a base metal like lead into a more refined material, such as gold. Did you know that alchemists are really philosophers deeply involved in a more challenging process? Their objective to create the Philosopher's stone is really a quest to refine the body, mind and spirit through the enlightenment of the soul. Like most sacred symbols, alchemical symbols present the soul and the divine, which many of us tend to disregard in favor of the material or tangible reality. the most powerful reminders of Alchemy are its ancient manuscripts with symbolic illustrations of smiling suns, crescent moons and strange words floating about or in soft, willowy banners or in orbs. I love to draw them when I was in school a long time ago, and they are still popular as art prints, stationery, digital graphics, and book covers today. 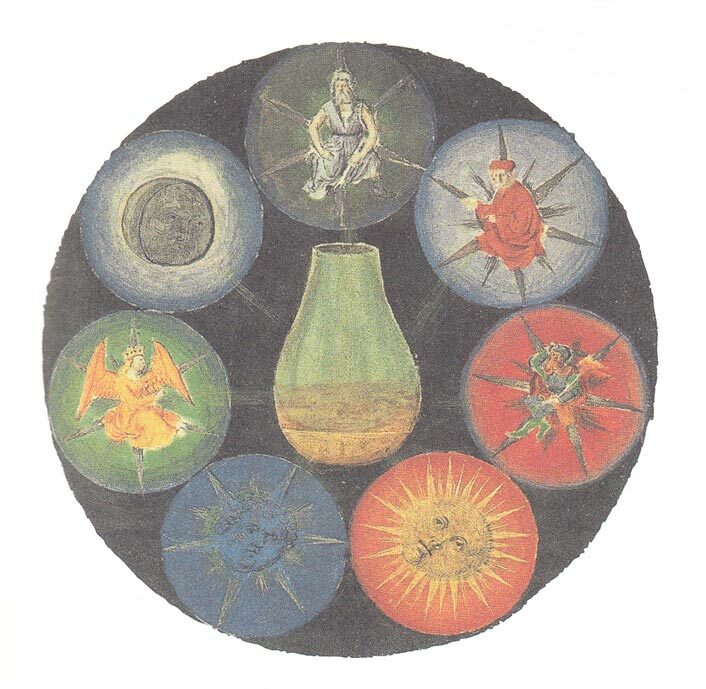 There are thousands of alchemical symbols and symbolic illustrations discovered to date. I hope you will forgive me if I pick only a few that I feel give the greatest impact, beauty and energy. While gazing at these symbols, or any symbol, always remember that they affect you quietly, in a subtle manner. You may or may not feel anything, but they hit you nonetheless. Just relax and let their wisdom work gently through you! If you would like to read more about Alchemy, see the quick facts here. You can also go back to the Symbolisms homepage from this Alchemy Symbols page.